This Scissor is made of stainless steel, with permanent auto sharp stainless steel blades, boasting of durability. Scissors feature a rounded tip blades for comfortable skin touch & comes with removable thumb rest. 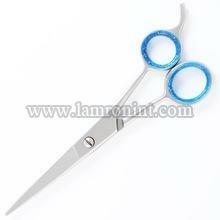 Excellent Professional quality Hairdressing scissors. Great fine finish, very SMOOTH. Scissors made of High grade Stainless Steel. Having a great grip of blades. Scissor has detachable finger rest. Evenly sharp blades for highly professional use. Comes with Leather Handy Bag. Material: Premium Grade Stainless Steel. Fine Polished to High Standard finish. All Instruments are fully autoclavable. Suitable for both professional & personal use. Images are only for illustration purposes.